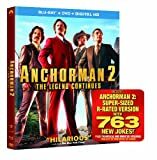 Blu-ray Combo Pack includes THREE versions of the film--the original Theatrical Version, the Unrated Version and, in a home entertainment first, the Super-Sized R-Rated Version with 763 new jokes! Never before in the history of home entertainment has anyone replaced 763 jokes. This must-own three-disc set also features OVER FOUR HOURS of bonus content. 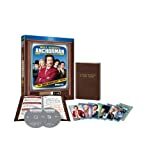 Starring Will Ferrell as the titular news anchor who is suddenly faced with the encroaching equality of women in the workplace, ANCHORMAN is a hilarious take on the battle of the sexes. The beloved and treasured film that amazed and inspired a generation also stars Steve Carrell, Paul Rudd, Christina Applegate and Fred Willard. Stars Alicia Silverstone in a break-out performance as Cher, a beautiful and self-absorbed high school student who spends her days focused on assembling the ideal fashion ensemble, talking her way out of bad grades and searching for the perfect boyfriend. What Cher discovers is that popularity only gets you so far, looks can be deceiving and love is sometimes found where you least expect it. Whatever.